Anita Harris joins The Piccadilly Dance Orchestra for a musical tribute to the 70th Anniversary of the end of World War Two. The show features the great songs and swing numbers which cheered the troops on their sentimental journey home - and lifted the spirits of the world during the turbulent war years. Their programme includes the likes of: In The Mood, American Patrol, Chattanooga Choo-Choo, We’ll Meet Again, Dream a Little Dream of Me, The Anniversary Waltz and The White Cliffs of Dover. Anita Harris says she has “a wonderful time with Michael Law and his great Band..... It’s so good to sing songs of that era with such good players”. The PDO are acclaimed worldwide for their spirited recreations of the music of the British Dance Bands. They enjoyed four years residency at The Ritz, six years at the Savoy and are currently undertaking their own series of dances at the legendary Café de Paris. "The sumptuous Savoy Hotel was transformed into a spectacular Speakeasy. The Piccadilly Dance Orchestra ensured that everyone was up on their toes ...VIP guests such as Elizabeth Hurley, Stephen Fry, Lulu, David Furnish and Tracey Emin were soon transported to a bygone era" - NOW magazine. Owned and managed by Michael and Alan Bennett-Law, The Piccadilly Dance Orchestra were especially chosen for the highly successful BBC 4 series Len Goodman's Dancing Feet and the sequel Len Goodman's Dance Band Days. The orchestra has also played on television for Wogan, Daytime Live, Pebble Mill, Play It Again and Lorraine Live. BBC live radio broadcasts include: Radio 2’s Arts Programme and VE Day celebrations from Hyde Park, a live lunchtime concert from the Wigmore Hall for Radio 3 and a special edition of Loose Ends to celebrate the 75th anniversary of the BBC on Radio 4. You can also catch The PDO in the Helen Mirren/Michael Caine movie Last Orders, playing Chattanooga Choo-Choo! The Piccadilly Dance Orchestra promise a splendid evening for jazz fans, lovers of vintage popular music and nostalgia enthusiasts alike. See them at The Apex on Saturday 12 September at 7.30pm. 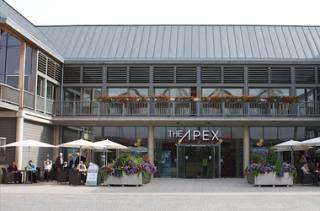 Tickets are £20, call the Box Office on 01284 758000, or visit www.theapex.co.uk for more information, or to book.